Having visited Iceland earlier in the year (feel free to read more about that adventure in my Iceland Blogs), the country's insurmountable beauty left me inspired and craving more nature. I wanted to wade in more turquoise waters, hike amongst majestic mountains, and oh boy I got to do just that. As this working season of my life comes to a close and I start at the University of California, San Francisco School of Pharmacy this very month, I decided to celebrate with one last shebang! 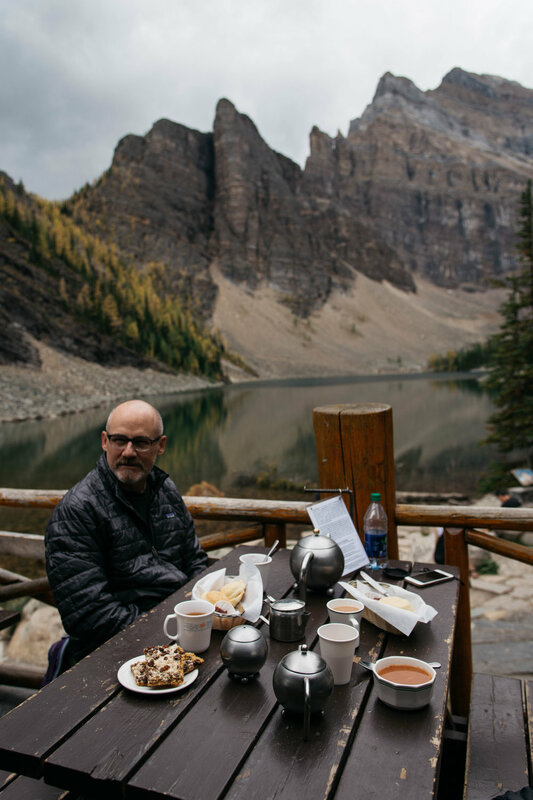 With 2017 being Canada's 150th anniversary, the country has decided to celebrate and offer free admission to their national parks, which lucky for me includes Banff National Park. Many people looked at me and chuckled when I told them I was going to Banff, "you mean like BAMF?!" they would giggle. So yes, AWESOME park name, and a BAMF national park. 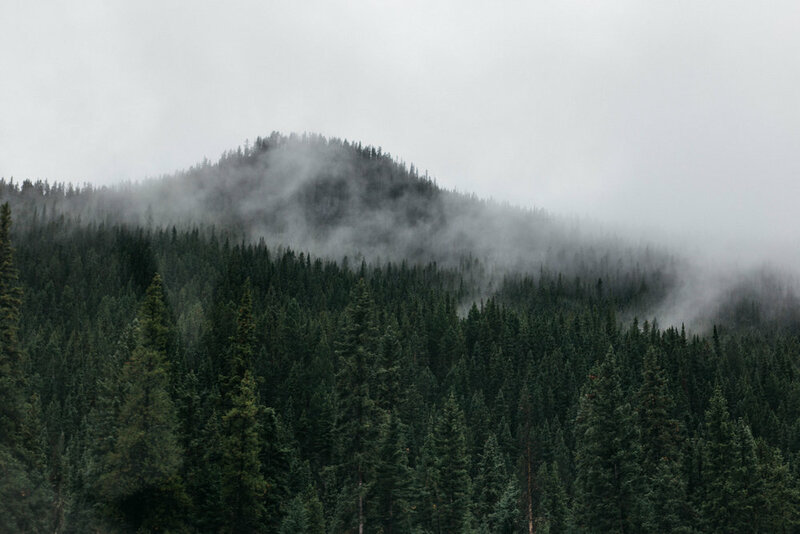 For those of you who don't know where Banff is, it is located in the province of Alberta in Canada (just one province east of British Columbia, the province in which Vancouver resides). The closest airport to fly into would be YYC, in the city of Calgary. The edge of the national park would be about a 90 minute drive from Calgary, which honestly is a really nice easy drive. 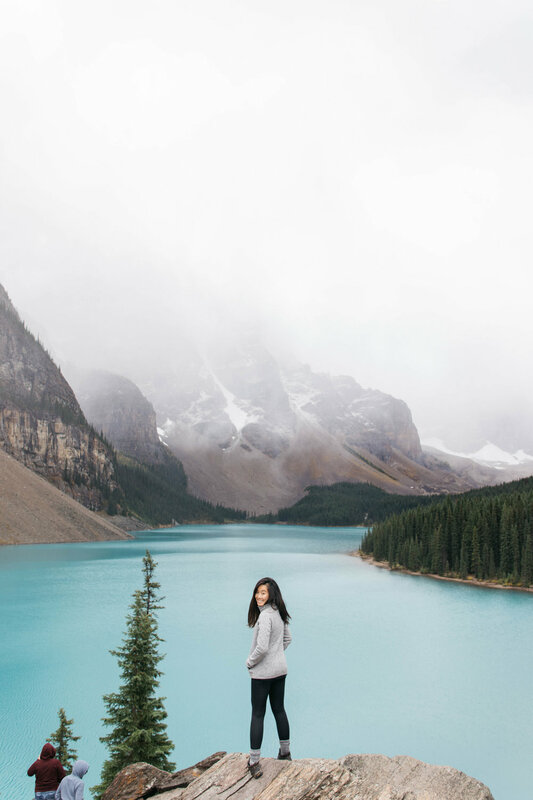 Banff is home to some of the most stunning lakes I have ever had the privilege of visiting, and since the lakes were personally my favorite part of Banff, I am way too giddy/excited to share what I've seen! Lake Louise is by far one of the most beloved lakes in Banff. Having grown up in San Francisco, I've developed a natural tendency to veering away from crowded, touristy spots. Although I feel like it's always worth it to drop by and see, I rarely feel a desire to stay for long amongst the large crowds. 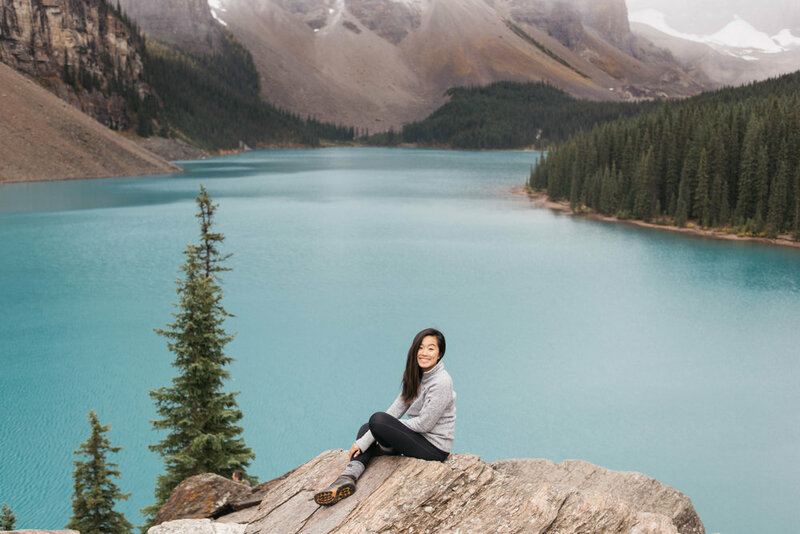 Lake Louise is popular because of its accessibility (you don't need much of a walk to get to the lake's viewing spot) and of course, turquoise waters. Although this lake is a hot spot for tourist busses to stop by, I felt my step slow down when I first approach the lake and my heart stopped. A wave of peace flowed over me. I lingered, and I simply wanted nothing but to stay. The trick to Lake Louise is to get there early to minimize crowds and for parking accessibility since the parking lots get full quickly and you may get shuffled to the overflow lot and have to take a shuttle over. We arrived around 9am and I couldn't bring myself to stop staring. 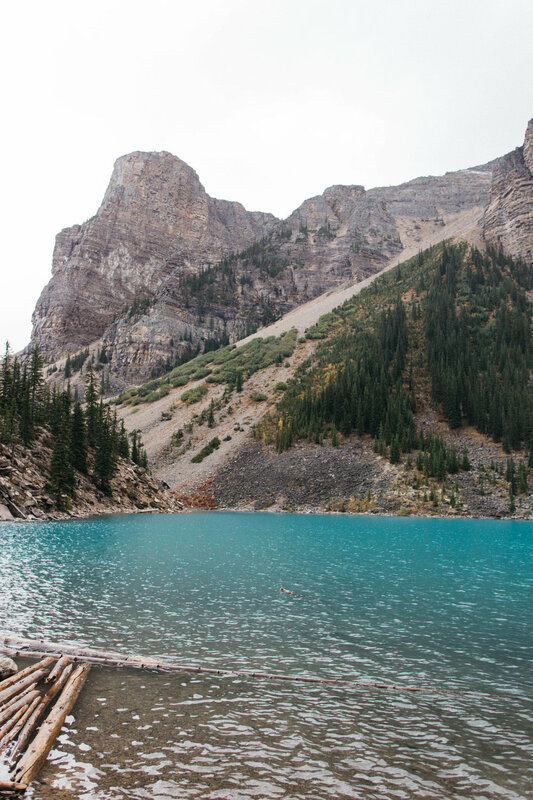 Majestic mountains hug the still, turquoise waters, making for a sight much more beautiful than any photo can capture. Eager to escape the crowds into the quiet waters, we rented a canoe courtesy of the Fairmont Hotel (fancy schmancy hotel right on the edge of the lake overlooking the waters) and waded on in. Now keep in mind it was lightly raining right then and there and we were trying to beat the heavy rain since the canoe rentals may close sometimes due to weather but hey, *shrug*, they were still open and a little rain never hurt nobody. A lot of the other canoes had pulled in because of the rain starting, but we bravely ventured out and ended up having the entire lake to ourselves for a good 20 minutes. I felt like a princess in a Disney movie paddling out towards the mountains, running my hands through the magically colored waters, turning around to see the man of my dreams behind me (shoutout to Harry ayyy). Lake Moraine is one of those lakes where you see the pictures and think to yourself, "No way the color of these lakes are real, they have to be photoshopped". Well, I don't own photoshop so here you go! This lake was much quieter than Lake Louise, but honestly it was just as beautiful. We saw two engagement photoshoots going on, and even a small wedding happening on the edge further down. This tells you how wanted and how gorgeous this lake is. It gave me the feels dude. Now having done some research, I knew there was a hike named the Rockpile Hike that took only 0.4 km one way to get to an upper view of the lake. There I was, standing to this literal huge pile of rocks (pictured above to the left) and thought to my smart self "well of course this MUST be the Rockpile Hike because it looks what its name says it is so here we go"! Although we admittedly had a really fun time scaling the rocks around 13m (or 43ish feet) up, we realized after we got to the top that there was a literal trail, path made and clear and nice with signs, that led from the back of the viewpoint back towards the parking lot. How we missed it I have no idea, but in case you don't feel like scaling those rocks, there is a nice easy hike on a literal path to the viewpoint above. The viewpoint is gorgeous and easy to get to so it is a must visit! Lake Peyto is another beautiful lake with an easily accessible viewpoint. It is only a short, but steep, 15 minute walk from the parking lot to the viewpoint. I encourage you to continue hiking past Lake Peyto to Bow Valley Summit if you want to wander beyond where most of the crowds stop. I think our timing to Lake Peyto could've been slightly better because the emerald color of the lake comes out best when the sun is shining right on it, but when we arrive all but a sliver of the lake was already cast under a shadow of the mountains. Nevertheless, the lake at a valley met by the convergence of mountains was still a beautiful sight to behold. There are a few other lakes I visited that are worth recommending if you ever have the chance to visit! 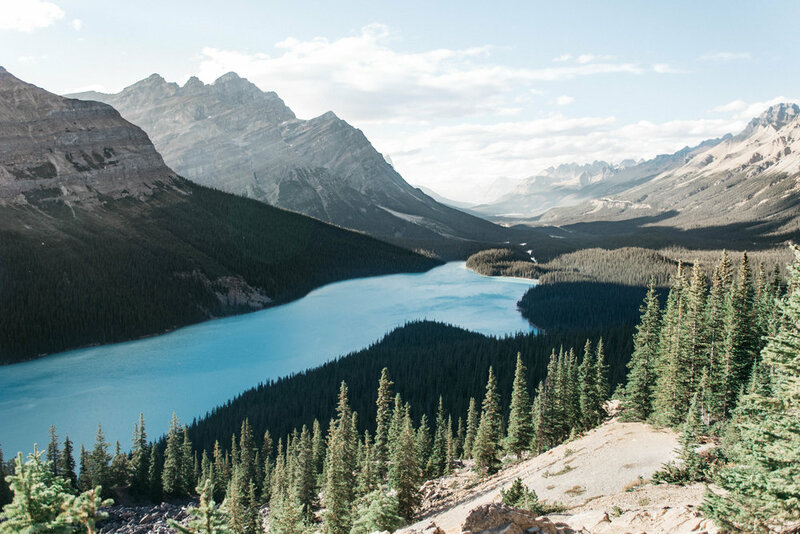 Other lakes (not pictured in this blog) worth visiting include: Bow Lake, Lake Minnewanka, and Two Jack Lake. Please go!